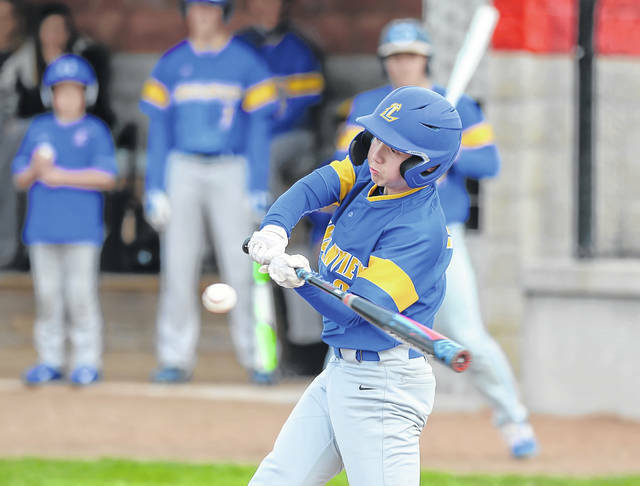 Landon Price bats for Lincolnview during Thursday’s game at Columbus Grove. 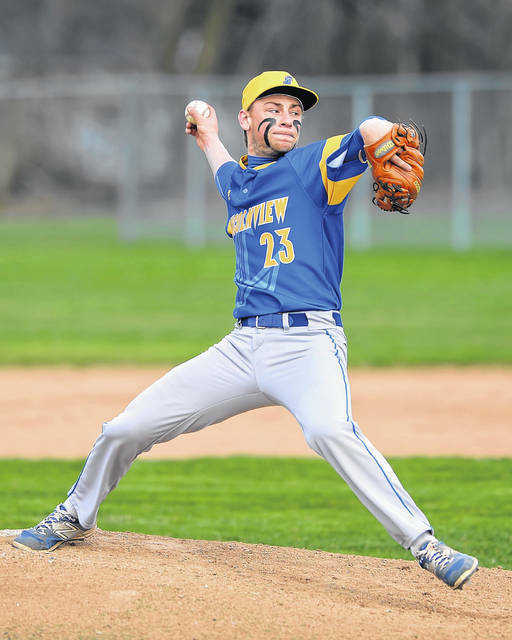 Lincolnview’s Jaden Youtsey threw 88 pitches, 61 for strikes in Thursday’s 4-0 victory at Columbus Grove. 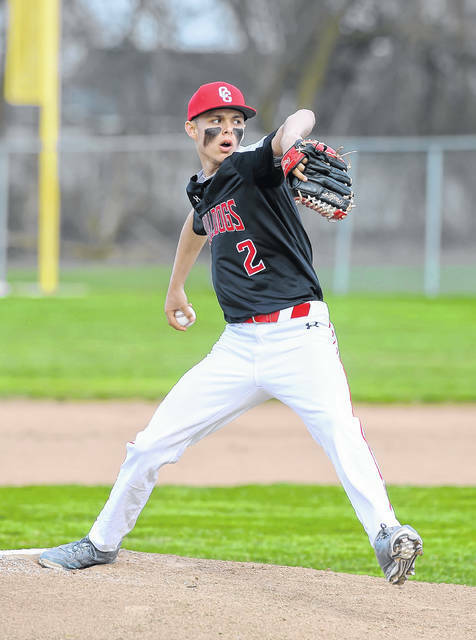 Columbus Grove’s Alex Schneider threw 73 pitches, 43 for strikes in Thursday’s home game against Lincolnview. Columbus Grove’s Nick Woods makes a catch during Thursday’s home game against Lincolnview. COLUMBUS GROVE — Lincolnview right-hander Jaden Youtsey locked in with his breaking ball early. That meant it was going to be a tough day at the plate for Columbus Grove. Youtsey fired a 4-0 two-hitter to power the Lancers over Columbus Grove on Thursday. Youtsey went the distance and gave up two singles, both in the fifth inning. He struck out eight and walked one. Youtsey threw 88 pitches, 61 for strikes. Lincolnview is 12-1, 2-0 in the Northwest Conference. Columbus Grove is 4-3, 1-2 in the NWC. Columbus Grove coach Eric Naughton liked what he saw from Youtsey. “He was hitting corners all day and making it difficult for us and keeping us off balance with that hard slider,” Naughton said. 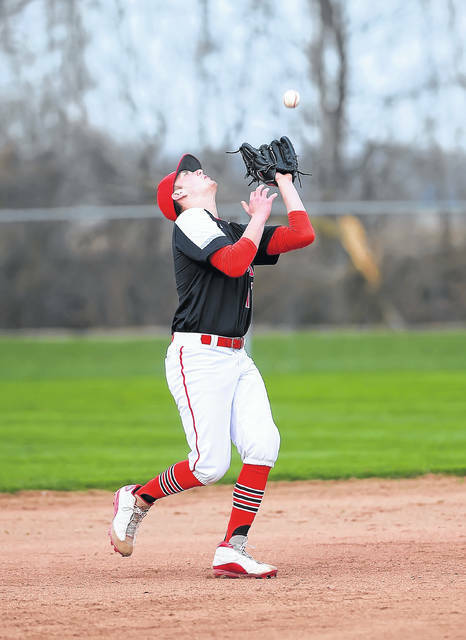 The Lancers scored the only run they would need in the first inning without a hit. They added one in the fifth and two in the seventh to finish it off. Right-hander Alex Schneider pitched well for Grove. Schneider went five innings and gave up two runs, both earned, on only one hit. He struck out five and walked four. Schneider threw 73 pitches, 43 for strikes. “He (Schneider) did pitch well and I wish he could have gone a little bit further for us, but he had a little arm soreness, so we’re just being cautious,” Naughton said. The Lancers’ Collin Overholt led off the game with a walk and stole second. Overholt stole third, while Jessee stole second on a double steal. Ethan Kemler hit a sacrifice fly to right to score Overholt and the Lancers led 1-0. Lincolnview didn’t get its first hit until the fifth with Cole Binkley singled to center. Binkley was bunted to second by Braxton Fox. Binkley took third on a groundout and came home on a wild pitch to give the Lancers a 2-0 lead in the fifth. The Bulldogs’ best offensive chance against Youtsey came in the home fifth. Youtsey had a no-hitter with two outs in the fifth and had retired 10 batters in a row. That’s when Brady Rudasil hit a line drive right back up the middle. Youtsey made a stab at it with his glove, but the ball ricocheted off the bottom of his glove hand and bounced close to second base for a single. Grove’s Kurt Griffith followed with a line-drive single to right. Rudasil tried to go from first to third on the two-out hit, but Lincolnview right fielder Thad Walker charged the ball and made a laser throw to third baseman Jessee for the out. Lincolnview added two runs in the seventh. One came on an infield error. The fourth run was produced on a squeeze bunt by Gavin Carter to make it 4-0. The senior Youtsey is a member of a strong Lancers’ pitching staff that includes Carter and Overholt. “Everybody plays a team and our pitching is excellent,” Youtsey said. This entry was tagged columbusgrove, lincolnview. Bookmark the permalink.